Valerio Rocco Orlando, My Own Little Damaged Piano, 2008, slide show. Installation view. The German company Niendorf has produced well-regarded pianos for more than a century, including one reclaimed by artist Valerio Rocco Orlando. His model, made in the 1920s, is damaged, ruined, out of tune, and in disuse after who knows how many glorious years of being played. In Orlando’s current exhibition, “Niendorf (The Damaged Piano),” curated by Caroline Corbetta, a two-channel installation offers a “four-hand”—or, more accurately, dual-spirit—light and sound composition. One screen depicts the salvaged old piano inside the Berlin warehouse where it was kept, shot with a handheld digital video camera wielded by the artist, who then edited the footage with extended, intersecting dissolves. On the other channel, composer Michael Nyman, filmed in front of that same Niendorf, announces that he might play this particular instrument for the last time. Here, Orlando cinematically shoots a close-up, neither of the piano nor of the composer’s hands on the keyboard, but of Nyman’s face, on black-and-white 35-mm film. However, this is not simply a celebration of one of the greatest living composers. Orlando manages to reveal the complexity of a present moment made up of history, multiple and intersecting planes of time, and intricate, superimposed emotions. The music that visitors hear—ancestral, sacred, almost mystical, yet made unique by the degeneration of the instrument—is not composed in Nyman’s recognizable, masterful style. The nearly psychedelic notes played on the old Niendorf, illuminated with neon lights reflected on the piano’s surface, are not meant to faithfully document the old musical instrument, as evinced by the extremely abstract nature of a nearby installation: Images taken from the video, accompanied by a luminous, imaginative musical score, are displayed in a room with black walls, into which viewers are only permitted to peer from the threshold. 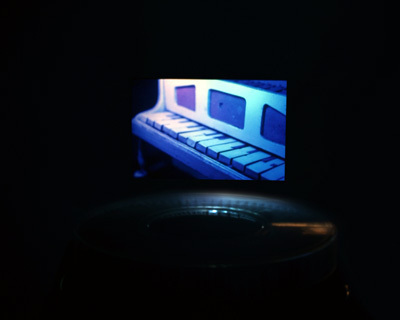 Finally, My Own Little Damaged Piano, 2008, is a slide show projected on a wall, comprising images of a miniature wooden toy piano from the early twentieth century, inherited by the artist when he was young. The instrument is illuminated by cyan, pink, and jade green lights, colors the artist associates with his childhood. Light appears, music follows, and early memories are evoked, perhaps those of Nyman, or of Orlando, or of anyone. What is more important is that past experiences come flooding back, as vivid as the ever-fleeting present.